On the 20th (Sun), discover the deep blue sea with a scuba or snorkeling tour. On the 21st (Mon), you'll have a packed day of sightseeing: take in the exciting artwork at Underart Gallery, then take in the architecture and atmosphere at St Monica's Cathedral, then kick back and relax at Trinity Beach, and finally enjoy the sand and surf at Palm Cove Beach. For photos, where to stay, traveler tips, and more tourist information, read our Cairns trip itinerary planner . Dublin, Ireland to Cairns is an approximately 28-hour flight. You can also do a combination of train, bus, and flight; or do a combination of train and flight. The time zone difference when traveling from Dublin to Cairns is 10 hours. Expect much warmer temperatures when traveling from Dublin in January; daily highs in Cairns reach 37°C and lows reach 28°C. Cap off your sightseeing on the 21st (Mon) early enough to travel to Brisbane. Relax by the water at Moffat Beach and Dicky Beach. Get a sense of the local culture at Queensland Museum & Sciencentre and West End. And it doesn't end there: look for all kinds of wild species at Lone Pine Koala Sanctuary, let little ones run wild at South Bank Parklands, take a stroll through Queen Street Mall, and explore the world behind art at Queensland Art Gallery. 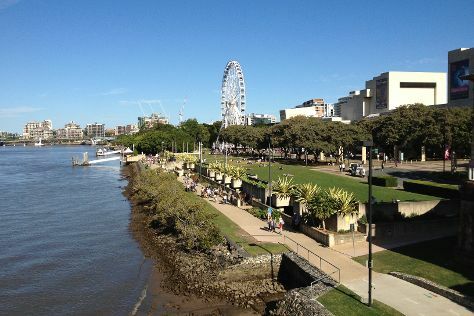 To find photos, where to stay, traveler tips, and tourist information, read our Brisbane trip itinerary maker website . Getting from Cairns to Brisbane by flight takes about 5.5 hours. Other options: do a combination of flight and bus; or drive. When traveling from Cairns in January, plan for slightly colder days and about the same nights in Brisbane: temperatures range from 34°C by day to 25°C at night. Finish your sightseeing early on the 24th (Thu) to allow enough time to travel back home.